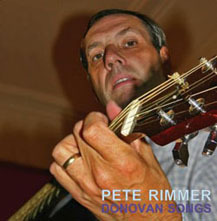 Pete Rimmer is a singer/songwriter - and long time Donovan fan - from Merseyside, North of England. In 1984 he had the chance to intervew Donovan for a show on Radio Merseyside. A few years ago, Pete issued a CD of himself singing Donovan songs entitled Donovan Songs. It's a recommended listening and can be ordered online (along with other of his releases) through abicat website. Click on a song title to play it! Published by Donovan (Music) Ltd.